True Wild Life | Green Bee-Eater | The green bee-eater (also known as the little green bee-eater) is a small species of bee-eater bird found throughout parts of Africa and Asia. The green bee-eater is one of 26 species of bee-eater, a group of birds that a primarily found throughout Africa and in parts of Asia and the Middle East. 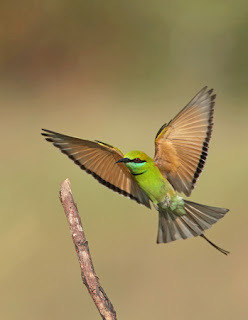 The green bee-eater is found on grasslands and in open forests on both the African and Asian continents, and is widely distributed across sub-Saharan Africa from Senegal and Gambia to Ethiopia, the Nile valley, western Arabia and Asia, from India to Vietnam. In Asia, the green bee-eater is usually seen on the lowland plains but these colourful litter birds can sometimes be found up to 6000 feet in the Himalayas. The green bee-eater is a small sized bird, rarely growing to more than 18cm in length. The green bee-eater is an easily distinguishable bird due to it's bright green plumage and attractive long tail-feathers. The green bee-eater also has a long, but sharp and narrow black beak which is perfectly designed for catching flying insects. The green bee-eater is known to be a slow starter in the mornings and may be found huddled next to one another with their bills tucked in their backs well after sunrise. The green bee-eater is also known to sand-bathe more frequently than other bee-eater species and will sometimes bathe in water by dipping into water in flight. Green bee-eaters are usually seen in small groups and often roost communally in large numbers of up to 300 birds. Like other bee-eater species, the green bee-eater primarily feeds on insects. 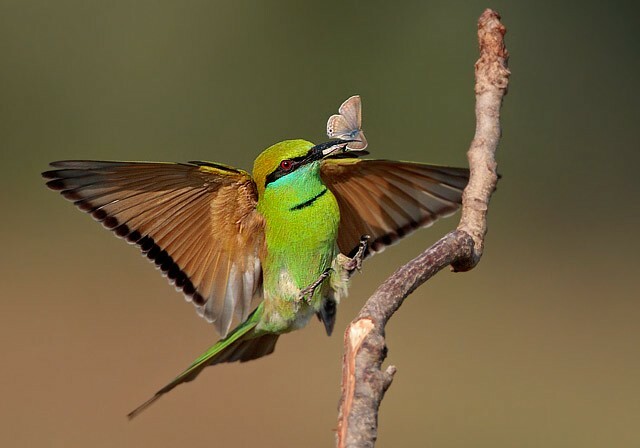 More than 80% of the green bee-eater's diet is comprised of honeybees and the rest is mainly made up of other bee species along with numerous species of flying insect. 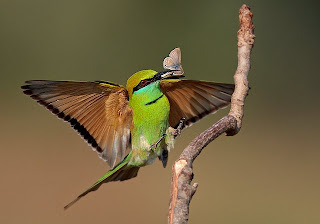 The green bee-eater is an omnivorous animal and will also eat fruits and berries along with ground-dwelling insects when it needs to supplement it's diet. Due to the small size and colourful appearance of the green bee-eater it is a target for numerous predators across it's natural range. 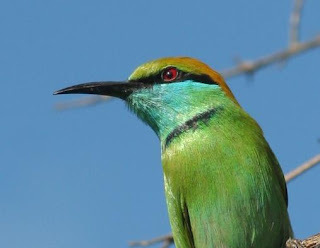 Larger birds of prey are the primary predators of the green bee-eater along with smaller mammals and reptiles that prey on both the birds and their eggs. Green bee-eaters nest between May and June in tunnels dug into the sandy banks. Females lay an average of 5 small, glossy, white eggs which are incubated for two weeks by both the breeding pair and others that have come to help. The green bee-eater chicks are cared for by their parents until they fledge (leave the nest) before they reach a month old. Today, the green bee-eater is classified as a species that is in least danger of immediate extinction in the wild. However, the decline in both their native habitat and bee population numbers around the world, could have devastating consequences for this plucky little bird. Well this is good info for me. Thanks for sharing this! 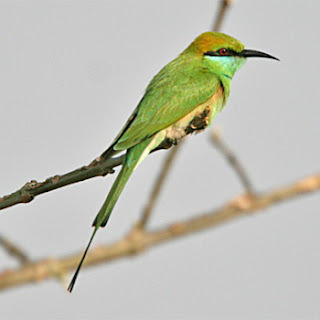 Green Bee - Eater is available in our country - Bangladesh.